PureVPN is a Hong Kong based VPN provider operating over 750 servers in an impressive 141 countries. Not only is the network size impressive, but many features, including a wide selection of protocols, multiple device connection, and bandwidth capabilities, deliver a stellar performance. Read our PureVPN review to get complete details on this brand’s rating. PureVPN has a wide server network, some really advanced features, and a beautifully designed UI. It falls down a little on the performance of some of those servers and its privacy-guarding practices are not absolute. Overall, however, this is a VPN provider that we would be happy to recommend to almost anybody. Sign up with PureVPN today. PureVPN is a Hong Kong based VPN provider that operates over 750 servers in 141 countries around the world. While its network size is undoubtedly impressive, we tested other features that users have come to rely upon, namely setup, UI, VPN protocols, support, streaming support, price and more. Here’s a quick look what makes PureVPN a good contender and where it could improve. PureVPN stands out for its ease of use including quick set up, smooth user experience, payment methods and highly responsive customer support. Although it doesn’t support Netflix streaming, there’s alot you can get out of this service with no complications. PureVPN provides an online ‘help and support’ section that features setup guides for all the platforms its supports in addition to FAQs and a knowledge base. Online how-to’s are clearly explained and support representative are responsive in helping users resolve queries. Customers requiring more personalized service have two means to get in touch: live chat and email support. The online chat interface is slick and easy to use, showing delivered and read receipts so you’re never left wondering whether your message has been seen or not. Hand-offs between departments take a matter of seconds to go through. PureVPN bundles some cool features on its large VPN network, but how do those servers stack up in speed and performance compared to the large pool of competition in the VPN market? We fired up a TED Talk and measured the connection speed before and after connecting through a random Pure VPN server (we chose Dublin, Ireland, to test with). Before connecting, download speed was 40.7s Mbps and ping time was 12ms. After tunneling traffic through Dublin, download speed had fallen to just 2.65 Mbps while ping time had spiraled to 168ms. VPN users can always expect a connection drop, but a 6.5-fold decrease is certainly a steep overhead to pay for connectivity (admittedly, we chose a random server rather than the one automatically rated by the program). A nicely thought out feature for those wanting to choose the best server for their specific need is a “purpose” navigation menu allowing users to state what they are hoping to use the connection for (“watch sport channels,” “VOIP,” “optimized for China” are some options provided.) This improves users’ ability to hone in on just the right server for their needs – including those hoping to gain PureVPN torrent access. The company’s default protocol is not disclosed, although users have the option the chose whichever best suits their needs. While PureVPN’s logging practices may seem minimal, they were enough to help the FBI nab its customer Ryan Lin who conducted what authorities described as a “relentless cyber-stalking campaign against a young woman” while using its services. Although the service is based in Hong Kong, a popular location for VPN services, the Special Administrative Region’s freedom from Chinese internet censorship is not absolute. Users should always remember that achieving total anonymity online is extremely difficult in practice. Getting PureVPN running on a machine is not a complicated endeavor. The company offers apps for Mac, Windows, iPhone, iPad, and Android in addition to configuration files for Linux and Chromebook users. 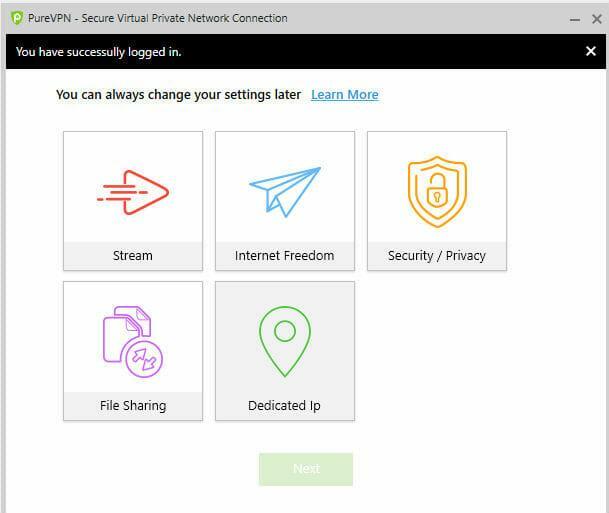 Unlike some of the best VPN providers, the PureVPN free download is available without having to create an account – a plus for the extra privacy-conscious. After installing the PureVPN download, users can begin using the program immediately (if they have a valid license, of course). One area in which this program really shines is its UI. After downloading the program, users simply follow a few short prompts to get the program up and running. Once they do, they’ll discover the breathtaking UI. We’ll be honest: at times, we felt like we were playing a video game rather than connecting to a VPN (the PureVPN server list is shown in real time on a map display). Okay, it’s not quite that good, but the company has invested some serious effort in crafting quality visuals for its users and the results are impressive. The main program window uses clean icons to help guide users to the part of the program that will best suit their needs (users can select whether they need the VPN to stream, gain “internet freedom”, obtain security/privacy, or conduct file sharing). One negative here however: the company hasn’t offered a clear response on the exact difference between Internet Freedom and Security/Privacy mode in the user forums, but we’re going to hazard a guess that the security option would be the better choice for those engaging in e-commerce and online banking. Popups from the notification area are also relatively unobtrusive and do not get in the way of the user experience. Our thoughts: nothing complicated about the process at all and a delightful UI. But despite the pretty graphics, how well does it actually work? After passing through the PureVPN login screen, users can gain access to a decent welt of fairly sophisticated options simply by perusing the system settings windows and editing the settings on their PureVPN account. PureVPN facilitates pinging servers on startup which is a useful way to test latency before choosing which server to connect to and see whether any packet losses occur during the process. The Speed Test Tool serves as a useful adjunct to the purpose menu to help users select the most efficient server for their browsing needs. PureVPN can be set to launch automatically with Windows and connect to a pre-defined server upon launch. While such a setup can also be configured manually, the fact that it is included in the program can save users’ time and effort. This feature is particularly useful for those needing a VPN connection to run on their machines all the time. 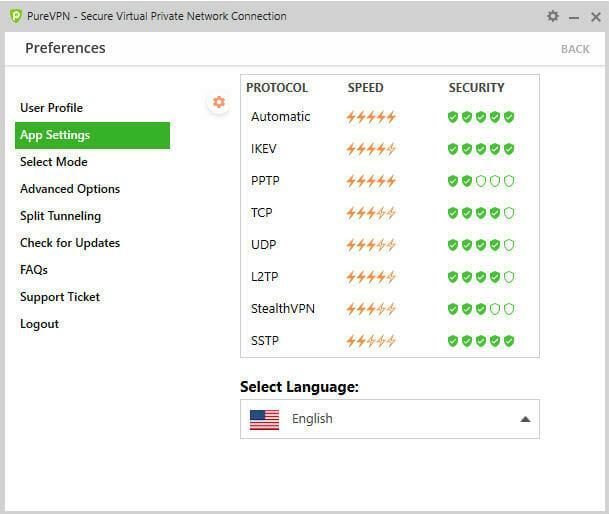 PureVPN supports a decent variety of protocols for connecting to its servers including IKEV, PPTP, and StealthVPN (a protocol that, like its name suggests, disguises VPN traffic as regular traffic and can even pass below the radar of deep packet inspection tools.) 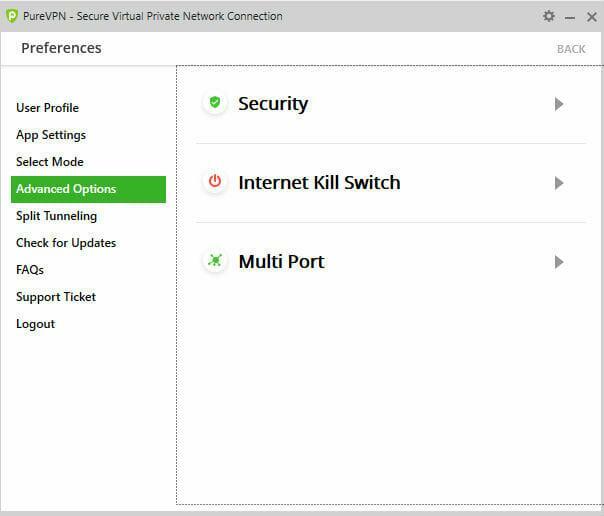 These granular options are good news for users with slightly unusual VPN-ing requirements (such as connecting from older hardware). Multi Port support is available on the Windows version. This feature automatically scans systems’ open ports in addition to closed or regulated ones and intelligently selects the best one to establish a connection with. This allows users to further improve connection reliability. Split tunneling is available on both the Windows version and PureVPN Android. Incidentally, the company also provides a PureVPN APK file in addition to making the app available through the Play Store. Split tunneling lets users separate their outbound traffic between VPN traffic and untunnelled regular traffic depending on configurable rules. The latter makes it a perfect choice for users that want to, say, force Netflix to connect through US servers but keep regular traffic behaving conventionally. Rating: 5/5: Advanced features and an easy UI are a winning combination! You’ve subscribed to your flashy new VPN and the first thing you want to do with it is break open the six pack and prepare to Netflix and chill. Not so fast! Netflix and VPN providers have been engaged in a game of cat and mouse since the dawn of time (okay, not quite for that long) and PureVPN seems to be coming out on the winning side of the battle. How do we know? There’s been a lot of to-do regarding if PureVPN works with Netflix. It’s large server network, kill switch feature, and split tunneling functionalities make it an optimal choice to stream this popular channel. Some say it does, some say it doesn’t – we opted to go straight to the source. According to PureVPN, their service DOES support Netflix. PureVPN’s large server network, kill switch, and split tunneling functionalities make it perfectly primed to be a great choice to PureVPN Netflix. We believe users are making a good choice when choosing PureVPN as their VPN service choice to stream Netflix. PureVPN will be kind on your ability to connect to overseas websites, but what about on your wallet? For those wanting to take it for a test ride, the company offers a 3 day PureVPN trial subscription for just $2.50. (In our opinion, this is almost a better try it out option than a 30 day money back guarantee, as there are no potential squabbles with customer service departments to deal with.) The regular pricing is $10.95 for one month only, $5.41/month for a 1 year subscription, and just $3.54 when two year subscriptions are taken out – a whopping 68% saving. All plans include a 7 day money back guarantee. Not sure whether you want to pay by credit card, Paypal, AliPay, or Cashu? 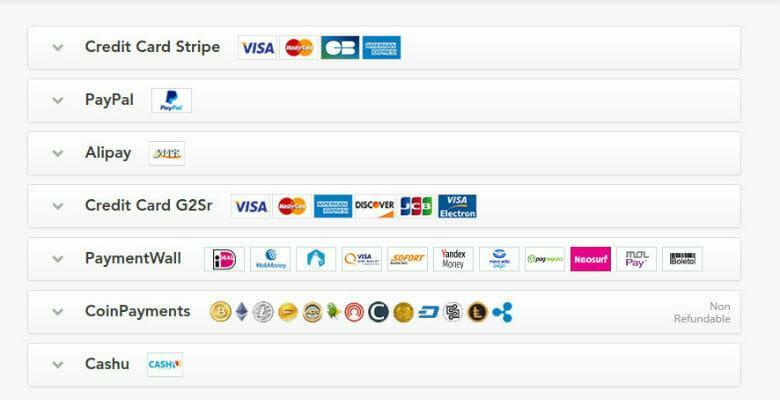 We have to point out that PureVPN also offers possibly the longest list of payment gateway options that we have ever seen on a website. The ability to pay by cryptocurrency is, of course, also provided. There is no PureVPN Free version as all plans are premium. PureVPN lifetime subscriptions have been offered in the past through some third-party affiliate sources such as StackSocial, but at the time of writing were not being offered through the company’s website. In the short term, pricing is about average. When two year subscriptions are taken out, however, the price is very competitive. As long as they get rid of any logs like they say they do it should be fine, but it’s not great to have that suspicion there in the first place. I have been using this service for almost a year and it is very solid. No problems with getting around blocks. They are right in that there are some speed issues, but as another commenter said, a lot of these issues are on remote servers. Sometimes I have problems on the top server in a country but if I switch to a secondary, it’s fine. Solid service for streaming too. How is Netflix managing to block some VPNs but not others?? I don’t understand?? Thanks for the great question! Netflix doesn’t always know exactly where a source of traffic is coming from, so it may simply look like a regular user is connecting from the US. The company doesn’t block VPNs entirely (i.e. they don’t place a blanket block on all ExpressVPN servers). Instead, the company looks for sources of traffic that seem suspicious (for example, if thousands of people are connecting from the exact same location), and block them. This means that VPNs aren’t themselves blocked, but rather the specific servers users are connecting through. We hope this helps answer your question! I find this article and the PureVPN service really confusing. I don’t think PureVPN can be used for Netflix after reading this, but once or twice the article contradicts itself. I know that VPNs are used for more than streaming, but even still, overall service seems really bare. When you add logs to that? Well, thanks for letting me know to stay far, far away! This is an awful service. I signed up towards the beginning of last year after reading countless glowing reviews, while foolishly ignoring the more critical reviews. The unparalleled speeds they boasted were probably the primary draw, and those definitely did not disappoint. The client GUI is very clean and easy to navigate, and there are plenty of servers to choose from. Until a few months back, the service worked fine, more or less. I’d get occasional DNS leaks on some servers, and would have to trial/error my way through the list before finding a good one, but the servers always seemed to correct themselves after a few days. Being a fairly patient person, I wasn’t too bothered by the inconvenience of bouncing between servers, so long as I eventually found one that was secure. Note: On the rating scales, I only went as low as one star because it really was a fantastic service in the beginning. Also, I rated Usability on how easy to use the client is, not on functionality. I rated Features with a median score, as they do boast a lot of attractive features, but few of them work correctly. The primary thing I find exciting about PureVPN is the customer service. I contact them easily if I have any problem with the server. It has numerous servers to select from. When I want togo anonymous, PureVPN is my shield. weren’t using a VPN. Definitely one of the best VPNs I’ve used. It’s pretty cheap – I signed up for two years and got the $2.91 p/m deal, and this works like a charm. I unblock content all around the world, which is nice as my country blocks the internet a lot, so now I can watch BBC iPlayer and Hulu and I am happy. PureVPN doesn’t slow down your computer, amazingly, and it has loads and loads of servers to choose from too. Some of the more out there ones don’t work so well, but this is pretty rare. This works really well and I use it all the time to watch things online and buy things online. Yes, they keep connection logs but these logs are scrapped every 24 hours. I think PureVPN is a great, fast VPN to use, in any case! They just confirmed they can access Netflix – I did and it streamed nicely too.